Press Council Chairman Justice Markandey Katju today trashed the idea of setting up Lokpal saying it was "completely unworkable" and the proposed anti-graft body would not be able to cope with the lakhs of complaints it may receive. "Lakhs of complaints will come which cannot be handled by one person, therefore 55,000 Lokpals would be required. Lokpal would be required in every district," Katju told reporters, adding he had been silent on the issue till now as people would say that he was "supporting corruption". "What is the guarantee that they would not turn corrupt? I feel that they would definitely become blackmailers," Katju said. You want to create a parallel bureaucracy then how will the government function. Incongruous,this is completely unworkable," he said. Katju said that as there are over 50 lakh government employees and lakhs of complaints may be filed which cannot be handled by one person. Justice Katju said this would involve infrastructure and expenditure including salary, accommodation, staff and office place. "Till now I was silent as I thought people would say that I am supporting corruption, but common sense has to be used," he said. Mumbai, March 27: Smriti Mehra will tee off at the 15th and final leg of the of the Hero Women’s Professional Golf Tour with an aim to not only win her seventh title of the season but also wrap up the Order of Merit, which she is leading by a handy margin. The veteran golfer, who was once on the LPGA Tour, has been in great form and has won six of the 14 events held on the Tour this season. In the first round of the 15th and final leg at the BPGC she has been paired with Nalini Singh Siwach, who herself has won three titles this year. Smriti, who has played each of the 14 legs has accumulated Rs. 7, 32, 100 while Nalini has Rs. 6,63,400. So, Smriti should win the Order of Merit for the season, even if she does not win the last leg. Sharmila Nicollet, who has missed some of the recent events, because of her engagements on Ladies European tour, will again be absent. She is lying third on Money List and Neha Tripathi with a good finish could overhaul her. AirAsia’s Big Sale Returns with Amazing Deals! Sepang, 27 March 2012 – AirAsia’s Big Sale is back again, with all-in-fares from as low as RM25 one way to domestic destinations and RM55 one way to international destinations across both AirAsia and AirAsia X’s route network. The return of the Big Sale is available on offer online from 28 March – 1 April 2012, and guests will be able to travel from 1 October 2012 to 31 January 2013. The promo fares will be available on www.airasia.com and all of AirAsia’s mobile booking platforms. All-in-fares are from RM25 one way to domestic destinations such as Penang, Alor Setar, Johor Bahru, Kota Bahru, Kuala Terengganu, Kuching, Kota Kinabalu and many more. Exciting international destinations such as Bali, Jakarta, Batam, Medan, Surabaya, Semarang and other exotic destinations in Indonesia are available from as low as RM55 all-in, one way. Guests can also travel to other great destinations such as Singapore, Hat Yai, Krabi, Phuket, Da Nang, Hanoi, Vientiane, Chennai, Kochi, Guangzhou, Shenzhen, Hong Kong, Macau and many more from RM55 one way as well. Guests may take advantage of this Big Sale and fly long-haul with AirAsia X from as low as RM225 one way to China (Tianjin, Hangzhou, Chengdu) and from as low as RM295 one way to Japan (Osaka, Tokyo), Korea (Seoul), Taiwan (Taipei) and Australia (Perth, Gold Coast, Melbourne, Sydney). In addition, guests may have the luxury of flying long-haul with extra comfort on AirAsia X’s Premium flatbeds one way from as low as RM949 to China (Chengdu, Huangzhou, Tianjin), from RM999 to Taiwan (Taipei), Korea (Seoul), Australia (Perth, Gold Coast, Melbourne, Sydney) and from RM1,699 to Japan (Osaka, Tokyo). Guests are strongly encouraged to book their value-added services such as Baggage Supersize, Hot Seats, Pick-A-Seat and AirAsia Insure online together with their flights as they are able to save up to 50%. As for in-flight meals, guests can now pre-book more than one meal on board, and at lower prices as well with the recent reduction of in-flight pre-book meal prices. Apart from that, AirAsia has also recently reduced its processing fees from RM8 per guest per sector, to only RM5 per guest per sector. Processing fees are not applicable for BIG card users. Counter check-in fees are also waived for international bound guests across all of its hubs and stations throughout the route network. Earn BIG Points every time you spend with AirAsia and other BIG partners worldwide to redeem free flights with the world’s best low cost airline. More details on BIG at www.airasia.com. Get tips and tricks on how to grab your Big Sale seats at AirAsia’s social media channels by following them on Twitter (twitter.com/AirAsia) and Facebook (facebook.com/AirAsia) apart from getting the latest promotion updates and other AirAsia activities. We are constantly working at bringing people together, linking potential partners and enhancing business. This week we bring to you a call for applications for this year's publishers trip to Germany. Over the years these trips have been very well received and are a key initiative of the GBO to link up the German and Indian book publishing professionals and to increase the exchange of rights between the two countries. Jumpstart is back with a bang. Avail special discounts by registering now! We also announce a new job opportunity at the German Book Office. Come and be a part of this exciting team! One of the key aims of the German Book Office in New Delhi is to link up the Indian and the German Publishing Industry. Therefore the GBO New Delhi will organise again a publisher’s trip to Germany in June 2012. Meeting publishers from Germany in person will give the participants a unique insight into the German publishing industry. The Focus of this year’s trip will lie on the theme “Crime Fiction”. You will visit publishing houses from this field in Berlin and Hamburg to get to know the German key players. All publishers from South Asia, publishing in the field of “Crime Fiction” are encouraged to apply from today onwards. A fully organized trip to meet all the main publishers of Crime Fiction books in Germany. You will visit all the important publishing houses and meet with publishers, rights managers, editors, authors and marketing managers, etc. to gain invaluable insights into this segment of the German market while exchanging ideas, new concepts and negotiating rights. This is an all-expenses paid trip for travel and accommodation in Germany. Selected candidates will have to bear the cost of their international travel (India-Germany-India) and will apply for their visas independently and well on time. Any South Asian (India, Nepal, Pakistan, Bangladesh and Sri Lanka) publishing professional working in the field of crime fiction books. Deadline for applications is April 20, 2012. The applications can come from Publishers nominating an individual, or directly from an individual currently working in publishing. *It is recommended to arrive in Germany at 10 June and leave on 16 June. The Frankfurt Book Fair is running, in cooperation with the Federal Foreign Office, German Book Offices (GBO) in Beijing, New York, New Delhi, Moscow and Bucharest. The GBO New Delhi is looking with immediate effect for a Project Manager. This is a full-time position with a fixed term contract of 2 years. ∙ 3-5 years experience in Project Management, Marketing and Sales. ∙ Fluent in spoken and written English and Hindi. Knowledge of German preferred. ∙ Adept at using Microsoft Office and other related software. We offer you excellent working conditions in an international environment and salary as per industry norms. You want to accept the challenge? Then we want to meet you and are looking forward to hearing from you soon. Please send your application (CV, reference of work experience, 2 letters of recommendation) until 30th April to application@book-fair.com. For more information about our office please visit www.newdelhi.gbo.org. Please note that the recording of your application will be conducted by our Partner CONNECT considering the Data Protection Law. German Book Office New Delhi is a joint venture between the Frankfurt Book Fair and the Federal Foreign Office, Berlin. We always knew this election would be about two competing economic plans -- whether we get to build on our progress or see it taken away. But we had no idea we'd also be up against a social agenda that would roll back decades of progress, particularly for women's health. That means the consequences of this election will be felt in more ways than we'd counted on -- and what you do this week will help decide what they are. Will you donate $3 or more right now? 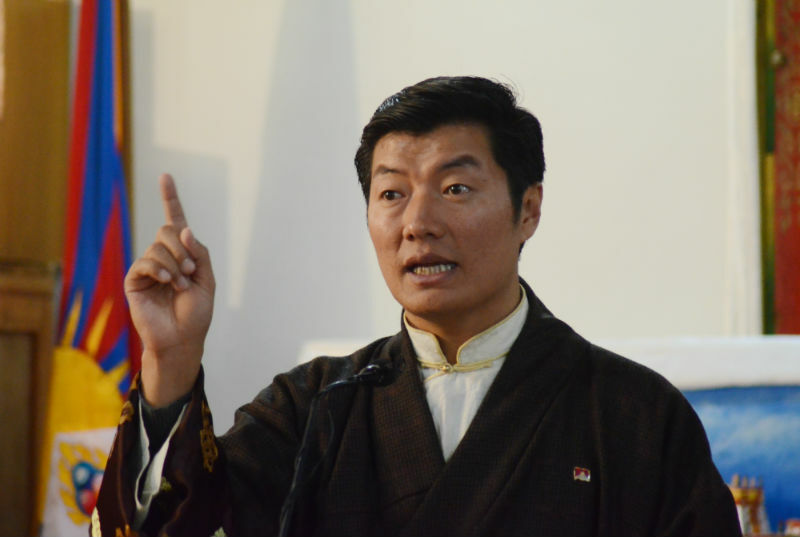 Dharamshala: Kalon Tripa Dr Lobsang Sangay said the UN's assurance to the three Tibetan hunger strikers to send a special rapporteurs to probe situation in Tibet is an "acknowledgement of a very grim situation in Tibet, and a sign of support for the truth and just cause of Tibet". Addressing a joint press conference by the Tibetan Parliament and the Kashag today, Kalon Tripa said: "What we hear in response the three hunger strikers in front the United Nations, after 30 days of major sacrifice on their part, an official from the United Nations visited the three hunger strikers. He assured, both verbally and in writing, that the United Nations will try to send a Special Rapporteur to investigate the actual situation inside Tibet, which we think is the acknowledgement of a very grim situation in Tibet." "And also from the news accounts that we have read that the Australian Ambassador in China has requested the Chinese foreign ministry to allow to visit Tibet to assess the situation in Tibet," Kalon Tripa said. "These two events, even though not the extent we would like to see, are in many ways are an indication that truth will be heard, truth will be supported, and hopefully truth will prevail. Truth being that Tibetans deserve their basic freedom, and His Holiness the Dalai Lama deserves to return to his rightful place in the Potala palace in Lhasa, the capital city of Tibet," Kalon Tripa said. Kalon Tripa said, "repeated appeals have been made by the Tibetan Parliament, the Kashag, and many NGOs including Tibetans, to the United Nations to send a special rapporteur or an envoy to Tibet to investigate the real conditions inside Tibet." The Speaker of the Tibetan Parliament-in-Exile, Mr Penpa Tsering, read out the 8-point resolution unanimously passed during the opening day of the ongoing parliament session on 14 March. The resolution reaffirms exiled Tibetans' solidarity with Tibetans inside Tibet, calls for the Chinese government to end its wrong Tibet policies, and appeals to the international community to send fact-finding delegations to assess the ground-reality inside Tibet. Kalon Tripa emphasised the Kashag's firm support to the parliament resolution, which he said makes very clear that Tibetans inside Tibet are in really critical condition. 30 Tibetans have self-immolated of which 22 have died and many are in critical conditions, he added. "The reasons are very clear. The self-immolators and the peaceful Tibetan protesters are showing the resentment against the continuing occupation of Tibet and the repressive policies of the Chinese government. What the self-immolators and those who have died and those who are in prisons are demanding that His Holiness the Dalai Lama returns to Tibet and freedom be restored for Tibetans inside Tibet," Kalon Tripa added. Speaker Penpa Tsering said the Tibetan Parliament will hold a separate press conference to put the spotlight on Tibet's critical situation when Chinese President Hu Jintao visits Delhi on 28 March. As BRICS leaders begin summit in New Delhi on 29th March, development banks of Brazil, Russia, India, China and South Africa's are in advanced stage of reaching a pact for extending cross-country credit in local currencies of the member countries. "...Such intra-BRICS initiatives will not only contribute to enhanced intra-BRICS trade and investments but would also facilitate our economic growth in difficult economic times," Commerce and Industry Minister Anand Sharma said on Tuesday. Sharma and four other BRICS trade ministers would be meeting on Wednesday, in the run-up to the Summit on Thursday. He said there is a large untapped growth potential of intra-BRICS trade and investments, "which we are presently focusing on for exploitation". Inter-BRICS trade is USD 86 billion. Demand slowdown in the western markets are hurting export and growth prospects of some BRICS members including India. China, the world's second-largest economy, registered a trade deficit of USD 31.48 billion in February. The country has cut its economic growth forecast to 7.5 percent from 8 per cent. India's economy is expected to grow by 6.9 per cent in the current fiscal, the slowest pace in three years. "While the new risks to global economy emanating from euro zone debt crisis and uncertainty in global energy markets will have their impact upon economic growth in the BRICS countries, I am confident BRICS countries will ... register strong growth," Sharma said. सवाल : कानून संविधान के मुताबिक संसद में बनते हैं वह संसद ही बनाएगी. जवाबः ऐसा सवाल खड़ा करके हमारे राजनेता जनता की दिशाभूल कर रहे हैं. हमने एक बार नहीं सैंकडों बार कहा है कि संविधान के मुताबिक कानून संसद में ही बनते हैं. लेकिन लोकशाही यानि जनतंत्र अथवा प्रजातंत्र में कानून का मसौदा(ड्राफ्ट) बनाना है तो वह समाज के अनुभवी लोगों को लेकर, सरकार ने बनाना है. ऐसे मसौदे को इंटरनेट और दूसरे माध्यमों के ज़रिए देश की जनता के सामने रखा जाना चाहिए. जनता उस ड्राफ्ट को पढ़ेगी, कुछ कमियां दिखाई देंगी तो जनता सुझाव करेगी. जनता से मिले सभी सुझावों को लेकर संसद में रखा जाना चाहिए. लोकशाही का मतलब है लोगों ने, लोगों के लिए, लोगों के सहभाग से चलाई हुई शाही. वह है लोकशाही? डा. बाबा साहब अंबेडकर जी ने संविधान को संसद में रखते हुए पहला शब्द दिया था – ”हम भारत के लोग”. २६ जनवरी १९५० में देश में प्रजा सत्ता का दिन मनाया गया. उसी दिन से जनता इस देश की मालिक हो गई. सरकारी तिजोरी में जमा होने वाला पैसा जनता का पैसा है. इस तिजोरी में से सरकार जो पैसा जमा या खर्च करती है उसका हिसाब किताब जनता को देना ज़रूरी है. कारण कि यही प्रजातंत्र है. उस पैसे के ऊपर जनता का कोई नियंत्रण न होने के कारण और उसका हिसाब किताब जनता को न दिए जाने के कारण भ्रष्टाचार बढ गया है. जनता इस देश की मालिक है. संविधान के माध्यम से प्रतिनिधि लोकशाही को हम भारतवासियों ने स्वीकार किया है. राज्य की विधान सभा में जनता अपने प्रतिनिधि के रूप में, अपने सेवक के रूप में, विधायक को भेजती है और लोकसभा के लिए सांसद को भेजती है. संविधान कहता है कि जनता के सेवकों को जनता के विकास के लिए उनके पैसों का सही नियोजन करना है. इसलिए लोकसभा और विधानसभाओं को कानून बनाने हैं. लेकिन जनलोकपाल जैसा बिल आठ बार लोकसभा में आकर भी पास नहीं किया गया. कानून लोकसभा में बनते हैं यह बात बराबर है लेकिन आठ बार लोकसभा में आकर भी बिल पास नहीं हुआ इसके लिए ज़िम्मेदार कौन है? जनता इस देश की मालिक है और मालिक ने अपने सेवकों को भेजा है. सेवक जब कानून नहीं बना रहे तो मालिक होने के नाते जनता को पूछने का हक है कि जनलोकपाल कानून क्यों नहीं बनाया गया? हमारा संविधान अस्तित्व में आए ६३ साल बीत गए. लेकिन जनता देश की मालिक है और हम जनता के सेवक हैं यह बात इन सेवकों को समझ में नहीं आई. यह देश के लिए दुर्भाग्यपूर्ण बात है. किसी दफ्तर में नागरिक अपने काम करवाने जाते हैं और कुछ पूछ लें तो कहा जाता है कि ”आप पूछने वाले कौन?”. जिस प्रकार जनप्रतिनिधियों को हम जनता ने अपने सेवक के रूप में भेजा है उसी प्रकार राष्ट्रपति जी ने जिन आई.ए.एस., आई.पी.एस., आई.एफ.एस. जैसे सनदी अधिकारियों का चयन किया वह भी गवर्नमेंट सरवेंट हैं. जनप्रतिनिधि एवं सभी सरकारी सेवक जनता के सेवक हैं. ”हमसे पूछने वाले आप कौन” ऐसा कह कर ये लोग संविधान का अपमान कर रहे हैं. अंग्रेज़ जुल्मी था. उसे भारत को लूटना था. इसलिए उसने अपनी मनमर्जी से कानून बनवाए और देश की जनता पर अन्याय व अत्याचार करता रहा. इस तरह वह नाजायज और अमानवीय कानून के आधार पर भारत को लूट ले गया. अब हम प्रजातंत्र में हैं. गणतंत्र में हैं. लोकशाही में हैं. अब कोई भी कानून बनाना है तो उसका ड्राफ्ट बनाते समय जनता के अनुभवी लोगों को साथ में लेकर ही ड्राफ्ट बनाना है. और तब कानून बनाने के लिए उसे संसद में भेजना है. मैं उम्मीद करता हूं कि राजनीति के लोग इस बात को समझेंगे. information, you may visit our website on www.dcnglobal.com. We wish to invite you to the inauguration of "INTRIGUED BY INDIA, THE ZEPHYRS OF GOA", an exhibition of paintings on Tuesday, 3rd April, 2012 at 5:30 pm at the Art Gallery of the Hungarian Information and Cultural Centre. Eminent artist, Mr. Paresh Maity has kindly consented to inaugurate the exhibition. The exhibits include works made by Hungarian artists at an Art Residency organised by the Art Indulge Foundation, the Hungarian Information and Cultural Centre and International Centre, Goa and by foundation members from India. We look forward to seeing you at the exhibition opening. Please join us for high tea after the inauguration.